IMPACT Step Up Summer Series II » Impact! « Inaugural iStepUp Program – What you missed! When was the last week that changed your life? We know when the next one will be! 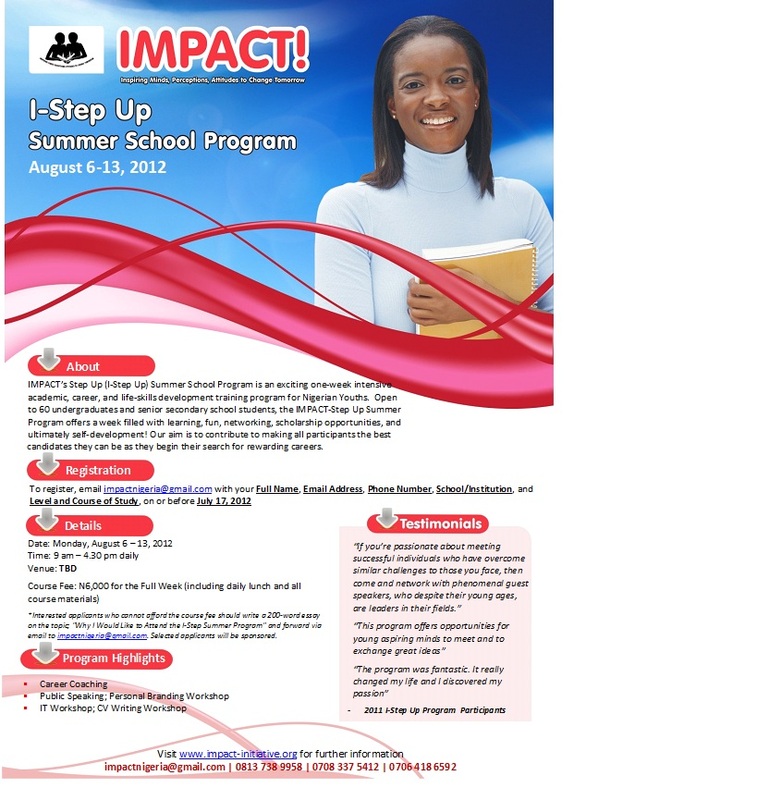 Aug 6th – 13th, the IMPACT Initiative hosts its 2nd iStep-Up Summer Program, a week of learning, fun, networking, scholarships, internships, and ultimately self-development, targeted specifically at senior secondary and university students. This year’s iStep-Up promises to be even bigger and better! If you’re worried…about improving your chances of finding and excelling at a job in your chosen field, the career coaches and career self-assessment tools are on hand to help you. If you’re stressed…about passing those terrifying employment aptitude tests, the sessions on quantitative and verbal skills cannot be missed. If you’re passionate…about meeting successful individuals who have overcome similar challenges to the ones you may face in your academic or future professional life, then come and network with the esteemed guest speakers – leaders in their fields who were not too long ago in your shoes. If you’re smart…and understand the importance of putting yourself at an advantage over your peers who may spend this one week idling away their summer holiday, consider this is your open invitation. • Interested applicants who cannot afford the course fee should write a 200-word essay on ‘Why I would like to attend the I-Step-Up Summer School Program’ and send it via email to impactnigeria@gmail.com. Selected applicants will be sponsored.